What planets to look for and how to collect Solanium in No Man's Sky NEXT. In No Man’s Sky NEXT, you’ll likely find yourself roaming the galaxy in search of resources like Chromatic Metal and even Solanium. While the process of collecting these resources is typically easy, knowing where to find them can be confusing. Especially if you’re new to the world of No Man’s Sky and No Man’s Sky NEXT. If you’re struggling to find Solanium, we’ve got you covered. Below, we put together a quick guide on how to get Solanium in No Man’s Sky NEXT! Solanium can often be found on Scorched Planets in No Man's Sky NEXT. 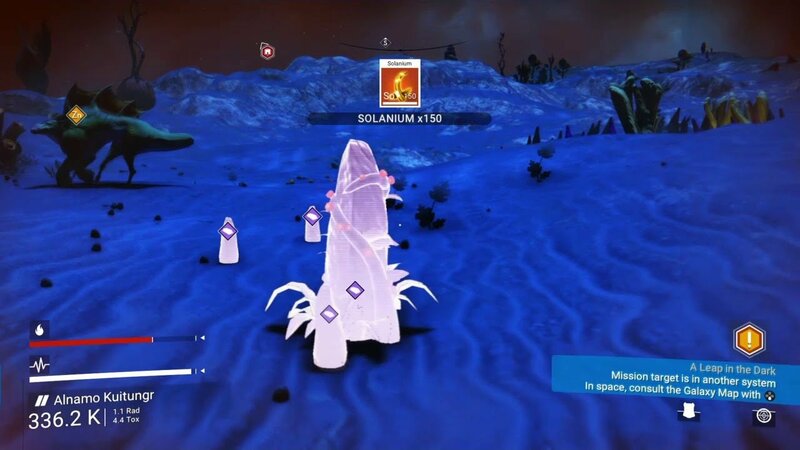 In No Man’s Sky NEXT, there are a variety of reasons why you’d need to know how to get Solanium from completing missions all the way to crafting. To get Solanium in No Man’s Sky NEXT, you’ll need to know what to look for. Solanium is typically found on Scorched Planets. By scanning a planet, you’ll be able to determine if it’s scorched or not. Another good tell for whether or not you’re dealing with a Scorched Planet is color, as Scorched Planets appear almost black in color. Note that Solanium can also be found in deposits in systems that orbit large, blue stars. Another thing to keep in mind is that to collect your Solanium, you’ll need to craft Hazmat Gloves beforehand. Once you’ve found a Scorched Planet or Solanium deposit, and have your Hazmat Gloves, you’re ready to begin stocking up. Solanium isn’t a resource that’s mined, but rather one that’s collected by holding the collect button similar to how you’d gather Sodium plants. With this information on hand, you should have no problem finding and collecting Solanium in No Man’s Sky NEXT. For more on No Man’s Sky NEXT, be sure to check out some of our previous guides including how to build and use a Portable Refiner in No Man’s Sky NEXT, how to get Chromatic Metal in No Man’s Sky NEXT, and how to get Cobalt in No Man’s Sky NEXT. By reading through this guide, you should now know how to get Solanium in No Man’s Sky NEXT.